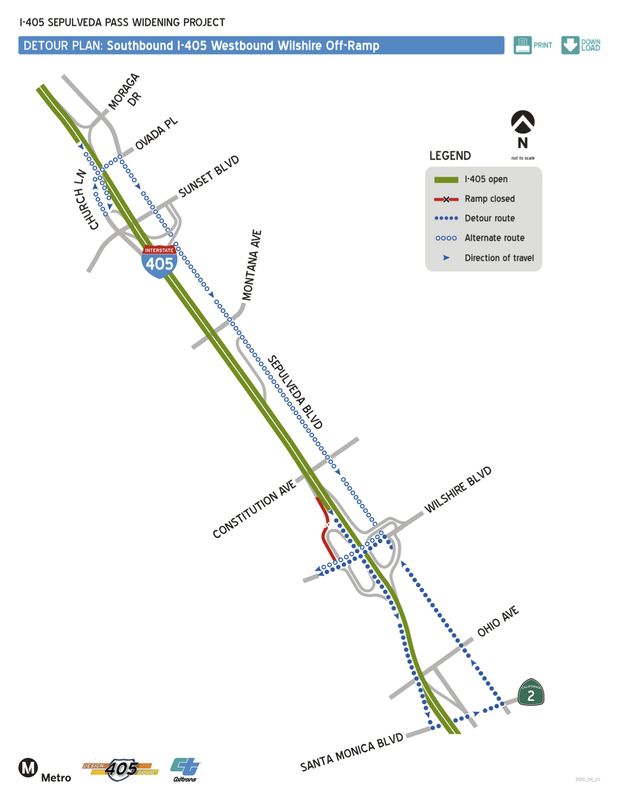 As part of its continuing work to improve the Wilshire/I-405 Interchange, The I-405 Sepulveda Pass Improvements Project plans to close the southbound I-405 off-ramp to westbound Wilshire Boulevard for two weeks beginning at 8 p.m. Friday, March 8, 2013. The new ramp is scheduled to open by 6 a.m. Friday, March 22. The Los Angeles Metropolitan Transportation Authority (Metro) and Caltrans advise motorists to plan ahead, adjust their travel times, or share the ride during this time to reduce traffic impacts. The ramp closure is necessary to demolish the existing off-ramp, rebuild it, conduct roadway paving and shift K-rail. This is the third ramp to be demolished and rebuilt to date as part of the eight-ramp Wilshire interchange improvement work. The detour route is as follows: Santa Monica Boulevard exit eastbound to Sepulveda Boulevard to Wilshire Boulevard. A detour route map is available on www.metro.net/projects/I-405/segment-detours/ (and is posted above). Changeable message signs will be used, and traffic control officers will be deployed to help direct drivers and mitigate traffic impacts. Once built, the reconstructed Wilshire Ramp interchanges will produce some of the I-405 project’s greatest local traffic improvements. By building new, seismically updated and higher capacity ramps, the project will reduce the vehicular conflicts between Wilshire Boulevard and the I-405. This should reduce backup at other north/south streets, and bring capacity to meet expected vehicle demands in 2031. The construction schedule is subject to change based on daily progress, weather and field conditions. The freeway improvements project is a joint effort between Metro and Caltrans and is being constructed by Kiewit Infrastructure West Co.
For additional project information or to obtain detour maps, visit www.metro.net/405. Follow the project on social media at www.facebook.com/405project and http://twitter.com/I_405. For real-time traffic conditions, visit Caltrans web site at http://quickmap.dot.ca.gov. The news release says offramp is closed, but the illustration has the onramp closed. Good catch! I removed the wrong map and am trying to get a new one. Thanks! The map shows ( in red) west wilshire to south 405 ramp as being closed when the correct ramp is the south 405 to west Wilshire off ramp.